In the preparation of a visit of several months in the Catalan capital, the choice of accommodation is often the point the most difficult to solve, few apartment is rented for periods of less than one year. Some tips to find a student accommodation Barcelona, quickly and in the best conditions. In Barcelona, the majority of home owners prefer to rent their apartment for periods ranging from 1 to 5 years, so it’s not easy to find a student housing Barcelona for few months. More, many are reluctant to rent to students, considered like revelers and insolvents. LocaBarcelona, agency specializing in the location in Barcelona has a wide offer of housing for student for renting monthly. LocaBarcelona not require bank guarantee or pay slip. Of more, the agency will avoid you loss of time, money and energy because you can choose your rent apartment in Barcelona from your country of origin, on internet with photos and descriptions of the accommodation and the possibilities to reserve it. This avoids having to visit the apartment upon arrival, and living in the hotel while beginning to study or work. The proposed housing to months have been designed for students and workers just passing through and are all fully furnished and equipped, frequently even already connected to the internet. A significant comfort when you arrive in an unknown city: You have already your home and you avoid the cost of hotels and worry of organization. Many business schools Barcelonan offer shorts programs for foreign students. This is the case for example of the EADA, EAE, ESADE, IESE, the European University, ESEC, IED and others schools offering MBA. Spain is also the favorite destination for the Europeans in the Erasmus program, Barcelona on the top. And given the lack of small apartments and studios, many live in “the Spanish inn”, that is to say roommate. LocaBarcelona has a great offer of student accommodation in Barcelona, flats with three, four or more rooms, renovated and fully equipped to a very accessible price for each of the roommate (280€ per person for the cheaper, 500€ for more luxurious). Students who come together in Barcelona may therefor choose this option and share a large apartment. Where to live in Barcelona? The district where you choose to live will depend of your tastes and expectations. The historic center, near the sea, is focusing most of the tourist activity and the nightlife of the city. It’s an area very animated. The district of the Eixample however remains central, but quieter. It may be useful to choose a Barcelona apartment close to the school, the university or the workplace, although the distances are not really a problem in the Catalan city. Barcelona it’s not very extensive and it is extremely well served by the public transport. Metros, buses and trams run frequently at a pace and in very large time bands. There is also a bike rental system, the bicing comparable to Parisian velib widely used in Barcelona. The city is well equipped with bike lanes. 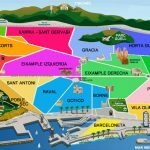 To learn more about the districts of Barcelona, don’t hesitate to consult the guide of LocaBarcelona.